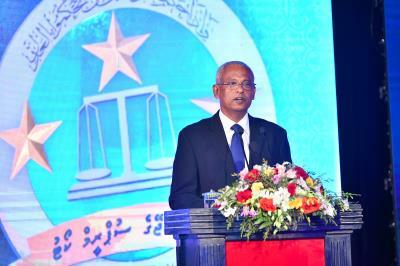 President Ibrahim Mohamed Solih has called upon the judiciary to make it their goal to ensure the rights of the people, as we embark on a new judicial year. The President made this statement while speaking at the opening ceremony of the Judicial Year 2019. In his speech, the President noted that since his assumption of office, he has accorded the most priority to ensure justice for those who have faced injustices in the past, without discriminating against anyone. In this regard, the President noted that work is underway to restore jobs for those who were unlawfully dismissed, fresh investigations have begun for cases of murder and enforced disappearances, investigation of corruption involved in awarding social housing was ongoing, and that the recovery of lost assets of the State was also underway. Speaking at the ceremony, President Solih said that the public was most hopeful for the judiciary to be safe from outside influence, and to be confident in its delivery of justice. Continuing on, the President noted that the Judicial Service Commission, which is tasked with appointing judges to the courts, is comprised of most members who are under two oaths with regard to their representation on the commission. He stated that hence the JSC members were those who must be models of sincerity. President Solih further underscored that it was not rules and regulations that were missing from our society, and rather it was honesty, loyalty and integrity within ourselves. He reminded that judges had a highly esteemed responsibility to the people, which was more than just a job, as their tasks were directly related to the people’s rights and lives. He also pointed out that the verdicts of the courts were what paves the way for stability and harmony within the society.